Those are wonderful ribbons, all of them! 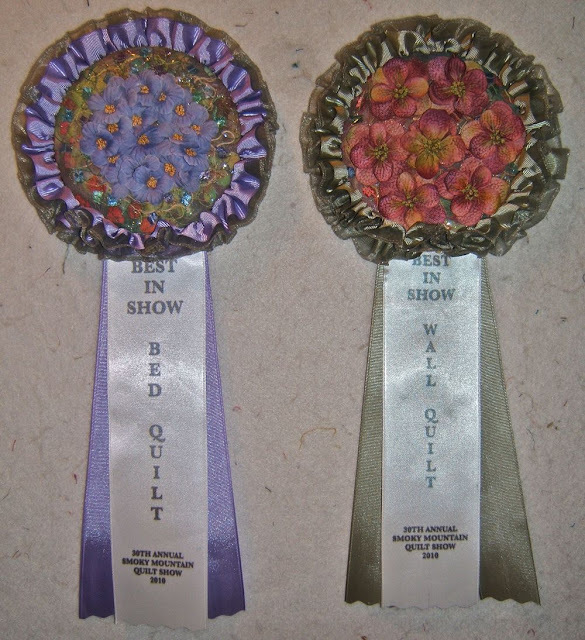 It must add a lot to the show for people to spot all the different ribbon designs. 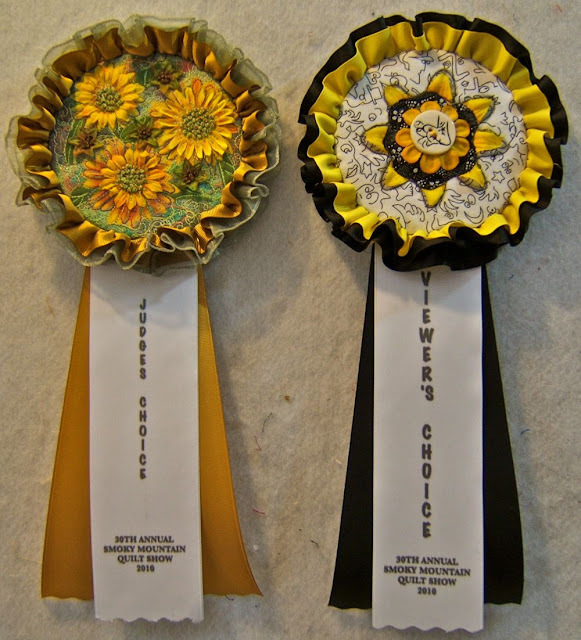 These ribbons are so beautiful and would make any of the recipients feel especially appreciated by your guild for entering something in your show. 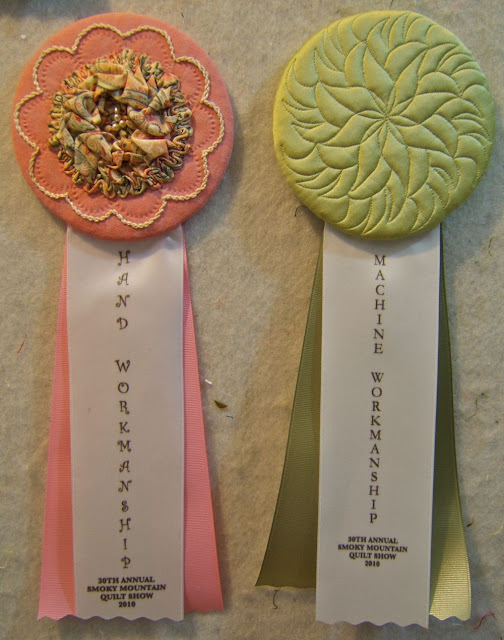 There was a discussion a week or so ago about entering shows and the pros and cons and it is the extra effort such as these ribbons that make all the work of shipping and entering well worth while. Your guild members are to be congratulated. There should be an award for award ribbons! They are so varied and each of them is a little work of art. It's easy to recognise your work in the one's you designed. They are all so much more special than the mass produced rosettes and will be greatly prized by those who win them. Well done everyone who had a hand in producing them. These are beautiful and so much work. It would have been an honour for anyone to have received them. Well done ladies. You had better design a ribbon for the ribbon designers. Now, those are rIBBONS! = to the subject matter! Hoorayyyy! Wow- those are truly impressive! Who wouldn't love to find any one of them hanging on their quilt??? I agree with Heather. There should be an award for the award ribbons. The biggest problem would be which one to choose - they're all great! What a clever idea. 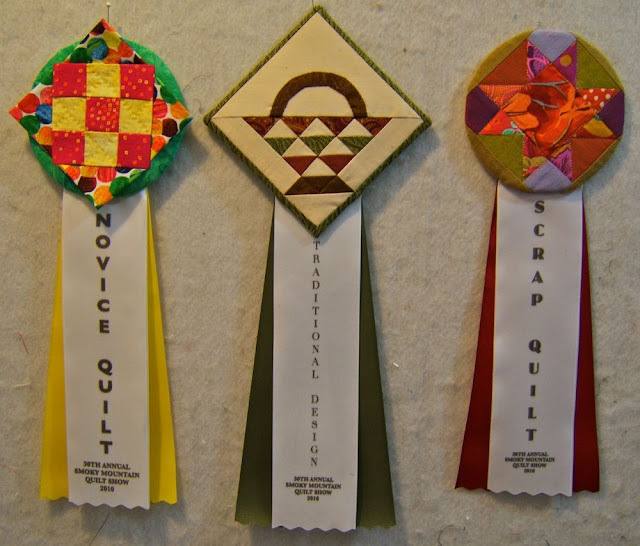 People must triple and quadruple their efforts just to get one of those wonderful ribbons! They are all gorgeous! 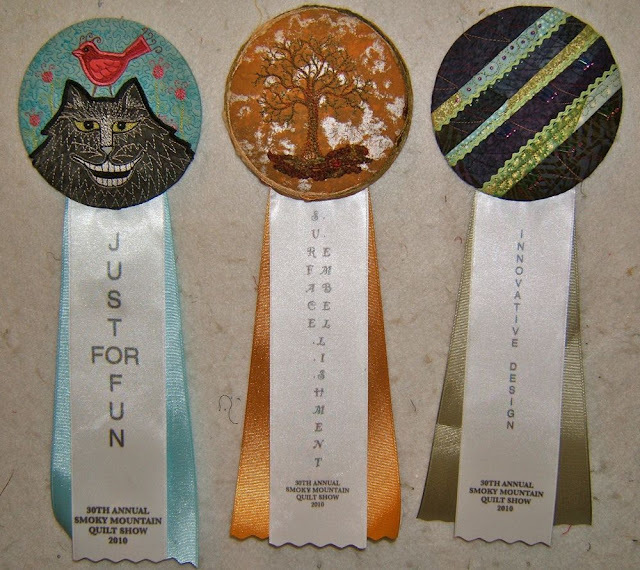 These ribbons are so inspiring Nellie!!! Every single one of them...but I especially like yours with the flowers both below and above the tulle. Brilliant!!! All so beautiful and great works of art!! Stunning! These ribbons are awesome! This could be a real money saver for my guild. Would you please elaborate on the new technique? Do you somehow run the ribbon through the printer? And, what is the reason for doubling the ribbon? Inquiring minds want to know :) Thanks Nellie!